A local charity, challenged with the task of establishing a new project in the village of Patrick, recently held a special candle-lit musical evening to help raise funds for their vision regarding the World War I internment camp previously based at Knockaloe Moar Farm. 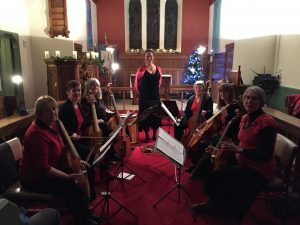 Holy Trinity Church, at the heart of the village’s community, became the venue for a concert of music performed by the local, early music group Hartes Ease, who delighted everyone with a range of songs and tunes. The programme of music reflected the many international links with the camp, which included almost twenty four thousand so-called ‘enemy aliens’ inside twenty three compounds, which were guarded by four thousand soldiers. The concert was intersected by English, Dutch and Manx compositions, with members of the audience enjoying glasses of gluhwein and bite-sized confectionery associated with some of the internees’ countries of origin. The charity’s aims are to re-tell the multitude of human stories connected to the camp, which became an important part of the Island’s history, but was almost entirely stripped bare upon the cessation of what was known as the Great War. It’s a long term project which will encompass other matters such as village life, and provide descendants with assistance as they attempt to seek details about either internees, guards, or villagers. The old school rooms, situated opposite the entrance to Knockaloe Moar Farm, have been ear-marked as the focal point for this project. Built in 1877, but relinquished as an educational facility during the mid 1980s, the building is, however, still utilised for a variety of community activities. A great deal of information has already been collected, but organisers would be delighted to hear from anyone who can add to their database. Although this information is currently offline, it is possible to request a search on a one-to-one basis, but may take some time to process. Alternatively, you can view some of their current work at www.knockaloe.im, or read about their activities on their Facebook page.